This weekend was super lazy for me – I even had a moment where I sat on the couch and thought “hrmm, what should I do?” The thing is, I have lots to do, heaps. But I just couldn’t be bothered. You know those moments where you kind of just, give up? I had that. I still did a bit of gardening in between the rain showers. And I cleaned a little. But for the most part I sat on my bum. I was happy about that too. Sunday was a little more productive. 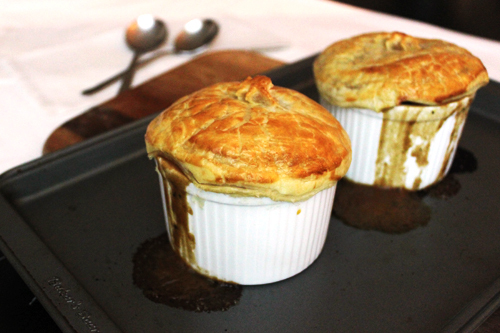 I had a lovely lunch with the girls, then went home and made these awesome little pot pies. It was the perfect weather for them too. It’s freezing right now! Seriously cold (well Perth cold). These pies with a glass of red, followed by a hot chocolate with marshmallows made for a nice finish to the weekend. Yeah I indulged. Not only did I not do any physical work, but I ate a lot. I need to do some exercise soon I think. This recipe comes from Neil Perry’s book, Good Food. This book is awesome! I have made a few things from it, and everything always works. It’s basic good food. My mum has made these pies a few times and they have always been a success. 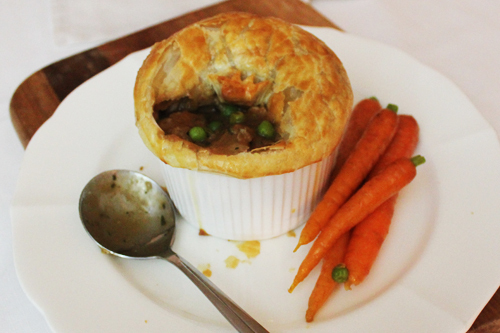 I didn’t change one thing about the recipe, although it gave me ideas for a range of different pot pies. And the best thing is, I only used half the mixture and froze the rest so I can make them next week. Oh, and I served these with some honey glazed baby carrots. In a medium bowl, add the flour and seasonings and mix, and then add the lamb and toss to coat so all pieces are lightly dusted. In a large heavy based oven-proof pot, add the olive oil and heat on high. Add the lamb in batches (making sure to not crowd) and cook for 1 – 2 minutes until the lamb is sealed and has a nice brown colour. Remove for the pot and set aside. In the same pot, add the onions and a pinch of salt, and cook until the onions have softened. Add the tomato paste and flour and cook for a further minute. Add the red wine and stock and stir well. When the liquids have come to the boil, return the lamb to pot and stir to coat in the liquid. Cover the pot with foil and place in the oven for 1 hour. Add the pea and mint and stir well. Divide the lamb mixture into ramekins or pie dishes (about 300ml each). Place the sheet of puff pastry over the pie dishes, making sure you have enough to hang over the edge of the pot. Firmly press the pastry down around the edges , and brush with the egg yolk. Bake in the oven for 15 minutes or until puffed and golden. Serves 4 (or 6 smaller ones).